Born Giorgios John Markopoulos on 12th March, 1928 in Toledo, Ohio (died 12th November, 1992 in Frieburg, Germany), he was the son of Greek immigrants from the Peloponnesus and spoke only Greek until the age of six. The ancient legends and orthodox spirituality of that tradition would prove a grounding matrix for the rest of his life. The concomitant isolation and displacement he surely felt, being homosexual and son of foreigners marooned in the vast American heartland was equally important to his aesthetic evolution. 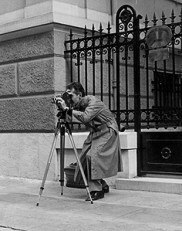 He could sense the world as a “heap of fragments,” intuit life as a “perrenial exile.” Having produced his first 8mm film at the age of twelve, as a brilliant young high school student he considered pursuing medical training, with an eye to surgery, but applied instead to several film production schools, even one in Russia, finally enrolling at the University of Southern California, Los Angeles, just at the end of WWII. There, he attended the master classes of Josef von Sternberg and was a student-observer to studio productions directed by emigrés Lang, Hitchcock, Curtiz and Korda. 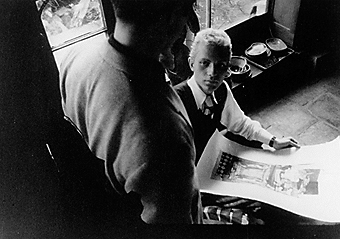 He also met future film director Curtis Harrington at this time, sharing with him an interest in the uses of exotic color and the hypnagogic literature of the poètes maudits. He was fascinated by the idea of synesthesia, the confusion and correspondence between impressions of different senses that had pre-occupied many Romantic artists, among them Wagner, Rimbaud and Scriabin. In 1947 he completed his first important color film Psyche, inspired by an unfinished Pierre Louÿs novella of lesbianism. This and two subsequent films made on his return to Toledo, after only three semesters at USC, formed a trilogy entitled Du Sang, de la volupté, et de la mort a profound, platonic/romantic meditation on the nature of art, emotion and the enigma of homosexuality. He was no doubt painfully aware at this point that his ambitious sensibility could be entirely shut out of the commercial scene by his own high cultural standards and the unspoken barrier of the ‚gay black list’. 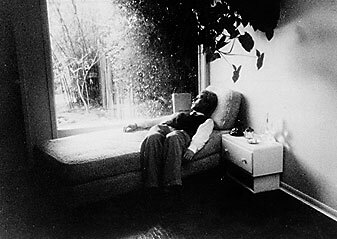 But he had received sustenance from Californian Avant-Garde circles, where Maya Deren, Sidney Peterson, and Kenneth Anger were all flourishing in the neo-baroque post-war American atmosphere receptive to Surrealism and psychoanalysis. The half-hour long unfinished (and later rediscovered), silent Markopoulos film The Dead Ones was shot on outdated Kodak black-and-white Nitrate stock for its special antique, dreamlike effects, and dedicated to modern French myth-master Jean Cocteau. In an orphic quest for redemption, Markopoulos would undergo, like Cocteau’s poet heroes, a symbolic ‚death in the mirror’ through the looking glass of cinema. In 1950, after filming the oneiric Rain Black, My Love (later recut and retitled Swain) which was based on an early Nathaniel Hawthorne story and contained surprising foreshadowings of his later editing technique, he embarked on the first of many trips to Europe. (After many struggles, he would eventually settle there.) In France, he met and observed Marcel Carné at work. Returning to the U.S., he found distribution for his films but was required to abridge Swain. This ‚need’ to excise and rework elaborate cinematic projects was to become a discouraging refrain in his saga, and served as a double-edged sword, driving him on to unforeseen levels of creative compression and invention even as it consigned countless moments of great beauty to oblivion. By the mid-fifties he had completed three more short films and held an exhibition of his abstract paintings in Toledo before leaving, undaunted, for Greece, where he would work for overs six years to bring plans to fruition for a multi-lingual, 35mm feature film of the Greek immigrant experience. Entitled Serenity, it was based on a novel by Elias Venezis depicting the aftermath of the Greco-Turkish conflict of 1920-21. 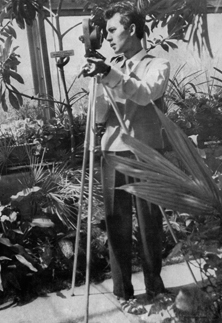 Revolving around the symbolic image of a rose garden, the film was to take place largely in the memory of its principal female character, the wife of an idealistic young physician exiled in the postwar diaspora. Color shooting finally began in 1958, under trying conditions (some scenes could only be filmed in one take), with a soundtrack recorded in English, Greek, German and Russian. A first version was then edited in Rome. After that a dire, truly Byzantine struggle with the film’s producers ensued that lasted over two years, exhausting and discouraging the filmmaker. During that time he continued to work on scenarios, three of which would be the bases of his major works of the 1960s. A trucated version of Serenity was finally premiered at Spoleto in 1961 and a longer edit was shown three times in the U.S. before disappearing entirely, forfeited by the director in return for his fee. It has not been seen since. 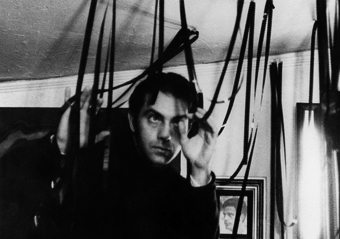 At this point work began on what is cetainly Markopoulos’s materpiece, Twice a Man (1963). A personal elaboration of the Phaedra/Hippolytos/Aesclepius myth, it brought his various concerns with psychodrama, memory, symbolic color and intensive montage to a new pitch. The modern reframing of the story focused on the Byronic melancholy of the Apollonian demi-god Aesclepius, “the artist-physician” (a stand-in for the filmmaker himself) obsessed with the image of the doomed prince Hippolytos, whom he is commanded to revive by the goddess Artemis. 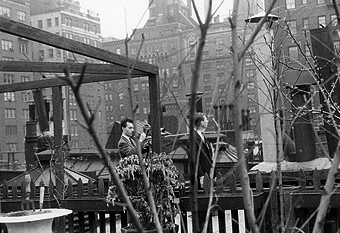 Shot in 16mm, with two assistants, on borrowed camera equipment, with unknowns Olympia Dukakis and Paul Kilb in the lead roles, the film was a model of creative economy. 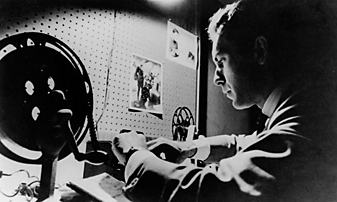 Encouraged by the response to Twice a Man (it won the Prix Lambert in Belgium in 1963), Markopoulos embarked on an even more ambitious, synoptic treatment of the Prometheus myth, entitled The Illiac Passion. He labored on it for more than three years (1964-67). Filming with an array of artist-performers picked from the glamorous New York scene of the time, he nearly realized a spectacular, three-hour long, triple-format, concentric-image version that would have far surpassed anything he had previously attempted in richness and complexity.Again, financing and crucial time restraints forced him to revise the work at the last moment, and it was cut for its premiere to the 90 minute, 16mm version extant. 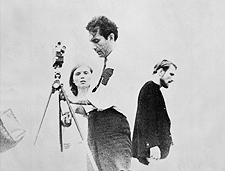 At this time, Markopoulos lectured widely and wrote extensively for Jonas Mekas’s Film Culture magazine, publishing both film reviews and theoretical articles. He became interestd in the multiple-screen and variable speed projection concepts that would later fire the ‚expanded cinema’ movement. In early 1966, immediately following the death of his mother, Markopoulos began using an ingenious and radically economical method to construct shorter films entirely in-camera, without subsequent editing. A single roll of film stock was run back and forth inside the camera apparatus, while carefully selected passages of frames were laid down (exposed), sometimes alone, sometimes super-imposed or fadedin and out, at precise positions predetermined by the filmmaker. Thus, a new genre of his film work was born: the ‘portrait’. The ‘sitters’ for these likenesses could be either persons, or individual places, in whatever vicinity the camera/brain might find itself on a particular occasion. The first portrait, Ming Green, was of his own apartment and was executed in a brief time during his period of mourning. A powerful mood piece, it uses only the light and color emanating from the enclosed surroundings and selected objects of his small, elegantly decorated flat. It evokes, without the presence of a single ‘living’ being, the reality of a life or lives, passing yet present, persistent, like a fragrance, reverberating with continued expectation. 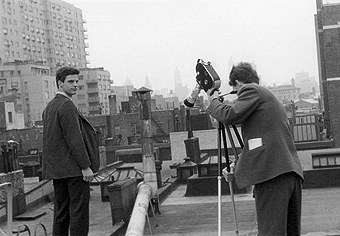 Markopoulos began using the new technique more and more, making numerous portraits while continuing to seek big-budget support for his other projects. But critical and financial frustrations grew. In 1967, after an unrewarding winter as professor of cinematography at the School of the Art Institute of Chicago, a stint that produced a last attempt at a peopled epic (The Divine Damnation), the artist moved definitively, with his lover Robert Beavers, to Europe. He worked on two television productions in Germany, then making his base of operations in Zürich, Switzerland. In the last ten years of his life, Markopoulos toiled over Eniaios, another, and the ultimate, reworking of his entire earlier film output. It was fully edited and notated, but left unprinted, at the time of his death. A completely silent eighty-hour long, epic re-configuration of his previous works, it contains 100 individual titles arranged in 22 cycles. Edited in the manner of the later, black-leader, films, it is to be seen ideally over several weeks, in a yearly summer-fetival held at the Temenos, a special open-air cinema theatre dedicated to Markopoulos’s works and those of Robert Beavers.